Keeping your kitchen organized can be quite the mission. Drawers and cabinets can be dangerous with all of that open space they give us. It seems that with every drawer opened comes a whole new world of clutter to clean up. 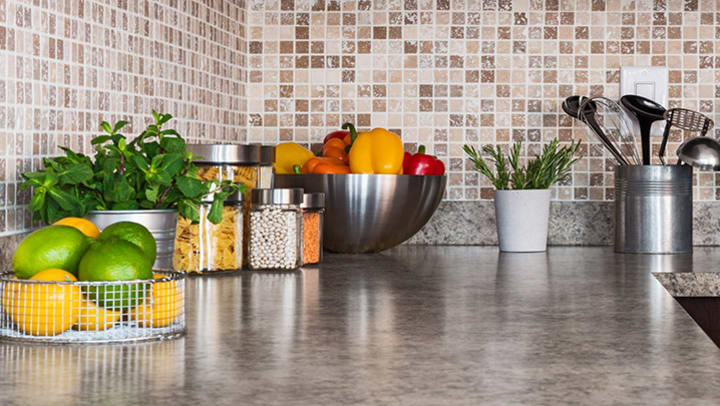 Check out these five kitchen organization hacks that'll keep your kitchen clutter free! Airtight, stackable containers are a must-have for any kitchen. Not only do they help you store food items like cereal, pasta, and flour that always seem to get knocked over, but they also allow you to easily keep track of how much of something you have left. Grab some clear containers of various sizes to store all of your boxed goods. You can even get creative and get ones with chalk labels on them for a cute aesthetic. Trash bags are always tough to figure out where to store. Do you keep them in the pantry? In a random cabinet? In the box under the sink? Paper towels belong on a holder so why not store your garbage bags that way, too? Pick up a few paper towel holders to attach to the cabinet wall underneath the sink. Next time you need to grab a garbage bag, all you have to do is pull and rip - no struggling with the mess of getting it out of the box. If you’re a produce lover, you know just how quickly potatoes, apples, and onions can add up. Plus, there’s never really a great place to put them. Some people have a big bowl where they put every vegetable and fruit they own. Others stick them in the fridge and hope for the best. Instead, grab some wire file holders, label them to your taste, and place them in one concise, easily accessible area. This way they’re not rolling around in open fridge or cabinet space where they can easily go missing or go bad. Everyone knows you can hang your pots and pans to declutter your cabinets, but what about the lids?! Lids are easy to throw inside an empty cabinet and never think about again -- until you need to find them for your pasta sauce, that is. To clean up that cabinet space, get a few small towel racks and attach them to a cabinet wall or door. Now you have somewhere to put the lids and you won’t have to dig through a stack of them to find the right size. Spices, cooking oils, and canned goods always seem to make their way into cabinets that never really get organized. Instead of shoving your oregano and parsley into an already overflowing cabinet, invest in a slide-out pantry! Slide-out pantries are perfect to fill in the ugly little gaps between your fridge and wall, and they make organizing your spices a lot easier. No more accidentally grabbing cumin instead of cinnamon -- you’re welcome! Do you have more pots, pans, and baking sheets than you really need laying around in your kitchen? Consider storing them with us! You never know when you’ll be hosting the next family gathering, so it’s better to keep those cooking essentials safe and sound in one of our secure storage units. All of our locations offer flexible, reliable, and extremely clean storage solutions that are sure to meet all of your space-saving needs. Get in contact with us here.